After the authorities decided to get cracking on students staying illegally in the post-graduate hostels run by the university, the students have begun complaining of “threats by musclemen” at the “behest of the authorities”. The Noida Authority has initiated action to cancel 51 industrial plots allotted during the last days of Ms Mayawati’s regime to some persons considered close to the powers that be. New Delhi: One person was killed and at least 40 persons, including 15 women and three children, were seriously injured when a Haryana Roadways bus collided with an RTV near Patel Chowk in the Maurice Nagar area of North district. Several religious organisations today staged a protest against the proposed slaughterhouse at Ghazipur. The Akhil Bharatiya Vidyarthi Parishad (ABVP) has announced a university bandh on August 19. The purpose of the bandh, the faction claims, is to highlight their grievances against the Vice-Chancellor. The Delhi Police is concentrating on tracing the two persons whose identity kits were released yesterday. It is important to trace these two persons as they had accompanied Pushkin Chandra and Vishal on the fateful night. The Union Minister of Home Affairs, Mr Shivraj Patil, told Parliament that the CBI had arrested three councillors of the Municipal Corporation of Delhi on charges of corruption and bribery during the last three years. The charge sheet has been filed against one of the councillors. A mafia is allegedly carrying out construction on a land that actually comes under the ‘Forest’ cover in the Aravali Hills area in the vicinity of the national Capital. The Supreme Court has already banned mining activities here. In a joint raid conducted by the Delhi Police and the FICCI’s Brand Protection Committee (BPC) in Najafgarh area of Delhi, machinery and packaging material worth Rs 5 crore has been seized. A shopkeeper killed another after a dispute over a stall in Amavas Fair by the bank of Ganga near Ram Ghat town. The culprit absconded after the crime. But a crowd of hundreds of people, belonging to a particular caste, chased the killer in village Gokulpur and beaten him to death. The Loni police in Ghaziabad arrested five notorious bootleggers of Bulandshahr and seized heroin worth Rs 50 lakh, which was being smuggled into Delhi via Bulandshahr. The accused were nabbed by the Loni police near the culvert of Roni village while they were going in a car and on a motorbike. Two persons, including a factory worker were electrocuted in separate incidents in the town during the past 36 hours. New Delhi: A local court today acquitted a businessman, accused in a smuggling case of an eighth century idol of Sun God to the US. The court acquitted him due to lack of evidence. Ghaziabad: A four-year-old girl was raped by a Ghaziabad Nagar Nigam employee who happens to be the uncle of victim’s mother. “The authorities have hired muscle men to intimidate students, particularly those who have dared to raise their voice against the irregularities committed by the inefficient authorities”, said a resident of Kothari Hostel. The hostel inmates, who have gone on a hunger strike to protest against the recent fee hike, claim that musclemen armed with lathis have come knocking at their doors on different occasions. “A student who was sleeping in his room was woken up by musclemen, who showered abuses on him and asked him to vacate the room within 48 hours”, said the resident. They alleged that the authorities had hinted that those students “who raise their voice will be implicated”. They also rued the presence of musclemen on the premises. Prof. Singh, however, vehemently denied this accusation: “We have hired some security guards because the old ones had retired, but they are not musclemen, they just look well-built”. The President of the Delhi University Teachers Association (DUTA), Mr Aditya N Misra, today alleged that he had been manhandled by the musclemen engaged by the Vice Chancellor, Mr Deepak Nayar. “We had gone to protest at the venue of a foundation stone laying ceremony when these musclemen accosted me. The teachers accompanying me were stopped and I was roughed up. They pushed me to the ground and harassed us”, Mr Misra told TNS. The foundation stone was laid by the V-C. The DUTA members staged a black flag demonstration at the site and have decided to continue holding such protests wherever the VC goes. Mr Misra has, however, refused to lodge a complaint with the Police, “I will take it to the Teachers Court and the General Body Meeting. We have decided to boycott the VC. In any case, I am out to save the university from this man and, therefore, would not like to get the police involved”. The VC remained unavailable for comment despite repeated attempts. This action is being taken after a one-man B.S. Mathur Commission had found that these plots had been allotted ignoring all rules. The whole plan for these allotments was cooked at the Patel Nagar residence of a person at the instance of a senior officer deemed close to the then Chief Minister, it is learnt. Fat amounts had reportedly changed hands for awarding the prime location industrial plots to the select group of allottees. The Mathur Commission is probing the allotment of 51 industrial plots involving 88,000 sq.mt. land on August 22, 2003. A meeting of entrepreneurs was called every Wednesday, according to Noida Authority sources. But before the file work on this allotments could be completed, the Mayawati government was changed on August 25, 2003. According to the Authority sources when the reports of impending change of the state government were pouring in, the layout plans of H Block in Sector-63 were summoned in the house of that particular person through the Noida chief at the instance of that particular officer deemed close to the then Chief Minister. All the interested entrepreneurs were called to that house and the prime locations of the plots allotted to them. In lieu all, the entrepreneurs were made to pay additional fat amounts as “Service Charges”. This block had been earmarked for VIP allotment. Five plots of 5,000 sq mt. each, 15 of 1,800 sq.mt., 23 of 1,000 sq .mt. and 7 plots of 800 sq.mt. each were allotted in H block, Sector-63 and A block of Sector-65. The biggest industrial plot was of 7979 sq.mts. The formalities of allotment of these plots were completed by a committee headed by the then Noida Authority, Secretary, J.P. Gupta. Representatives of the District Industrial Centre and the UP Finance Corporation were also members of this committee. The Mathur Commission is understood to have sought explanations from J.P. Gupta and other members of this committee. The process of cancellation of the allotment of these plots has been set in motion at the government level. Interestingly, the land rate was reduced from Rs 3,100 per sq.mt. to Rs 2,200 per sq.mt. in the Noida Authority Board meeting held on August 2, 2003, to facilitate the allotments to the chosen ones on cheaper rates. Significantly, these land rates had been raised to Rs 3,100 per sq.mt. from Rs 2,100 sq.mt. only a few days earlier in the Board meeting held in July 2003. The fact of reducing the land rate is being viewed seriously by the Mathur Commission, it is learnt. The incident occurred this morning at around 4.55 a.m. when the speeding Haryana Roadways bus collided with the RTV mini bus. The driver fled from the spot immediately after the accident, leaving behind the vehicle. The police have registered a case of causing death due to rash and negligent driving and launched a hunt for the erring driver. The religious organisations stated that the construction of the slaughterhouse would be a setback to the country’s agrarian economy and a hazard to IAF aircraft taking off from the Hindon Airbase. Led by Sarvadeshik Arya Pratinidhi Sabha, the apex body of the Arya Samaj, the demonstrators staged a dharna at the Jantar Mantar after they were stopped from marching to the Parliament House. The demonstration was supported by the Jain Samaj, Sanathan Dharma and dairy owners of the Ghazipur area in East Delhi. They said the Hindon Airbase, where IAF aircraft were located, was 6.5 km from the proposed slaughterhouse. The possibility of air accidents would increase due to vultures flying over the slaughterhouse. They pointed out that Ghazipur was a dairy farming area, with more than 1,000 dairy farms located within 2-3 km of the slaughterhouse site, and said the establishment of the slaughterhouse there would effect milk production of the livestock. They also said the transportation of flesh on a large-scale would pollute the atmosphere and lead to traffic hazard. A memorandum in this regard was later submitted to President A. P. J. Abdul Kalam, Vice-President Bhairon Singh Shekhawat and the Prime Minister. The Akhil Bharatiya Vidyarthi Parishad (ABVP) has announced a university bandh on August 19. 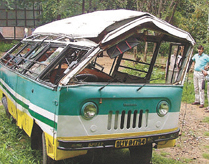 The purpose of the bandh, the faction claims, is to highlight their grievances against the Vice-Chancellor. “The Vice-Chancellor is autocratic and has even hired goons to suppress the students on the campus”, said ABVP State Secretary Nakul Bhardawaj. Among the demands that will be raised during the strike will be the need for more hostels, U specials, bus passes and declaration of results on time. “The university is flouting its own norms. They are supposed to declare the results within 45 days from the last day of the examinations. This has never been adhered to. Owing to this, the students suffer, sometimes they even lose out on a year because of late declaration of results”, Nakul said. He complained that the Vice-Chancellor, who he alleged was never accessible, “has hired muscle men to intimidate students, particularly hostellers”. “In Gwyer Hall, they broke the roof of the rooms while the students were still staying on the pretext of renovation. While no new hostels have been constructed, no attempt has been made to improve the condition of the existing ones,” Nakul added. Allowing DTC passes in buses running on STA permits and starting a shuttle service on the South Campus have also been sought by the ABVP. The Delhi Police is concentrating on tracing the two persons whose identity kits were released yesterday. It is important to trace these two persons as they had accompanied Pushkin Chandra and Vishal on the fateful night. However, the police is yet to ascertain the motive behind the murder and said that investigations were on. Several teams have been constituted and sent to various places to trace the duo and Pushkin’s Opel Corsa car, which was found missing after the murder. The police also contacted the Danish national, Uffe Gartner, who had organized the party in Sewa Nagar. Since he had provided the police with information about the identity of the persons present during the party, efforts were also on to ascertain the veracity of the information. The North-West district police today claimed to have solved the murder of the wife of Head Constable Savinder Tomar, who was found dead in her house in Shalimar Bagh Police Colony on August 9. Sampada was found murdered with at least five bullet and stab injuries. The police also claimed to have seized the licenced weapon of Savinder, one knife, cartridges and gold and silver jewellery worth Rs 35,000 from the accused, identified as Dheeraj, alias Sonu, a resident of Bawana. During the investigation, the victim’s brother, Mukesh Kumar, told the police that he had telephoned his sister on the fateful day and was informed that a person known to a friend of her husband, identified as Alisher, was in the house. When the police contacted Alisher, he provided the identity of the accused. Dheeraj was nabbed near Kela Godown railway station, when he came there to dispose of the stolen jewellery items. During interrogation, the accused admitted to having stayed in the victim’s house on August 5. In dire need of money, he decided to ransack the house in Savinder’s absence. Accordingly, Dheeraj reached the house on August 9 at around 10.30 a.m. and told Sampada that Alisher had asked him to wait in her house. Later, when Sampada telephoned Savinder to inform him about Dheeraj, Savinder told Sampada to ask Dheeraj to leave the house. However, the accused attacked Sampada and murdered her before ransacking the house. The Minister said that the MCD had, in pursuance of the suggestions given by the Central Vigilance Commission in various meetings held with its officers, taken a number of steps to eradicate corruption in the Corporation like setting up Consumer Care Centres or Citizen Service Bureau, provisions of internet facility to all Divisional Officers for uploading tender documents or forms from the website of the Corporation, videography of public land to check encroachment and identification of sensitive areas in the Capital. The Minister said that CBI has also arrested the Delhi police officials, Sanjay Gupta, sub inspector and investigating officer in the Pre-Medical test paper leak case, for allegedly demanding and accepting a bribe of Rs 2 lakh from the father of one of the accused persons. Rajesh Kumar, Sub Inspector and Umed Singh, Constable, were also arrested on charge of accepting bribe. They all have been placed under suspension and an Assistant Commissioner of Police, who was supervising the case, has been transferred out of Delhi. The Minister has also said that the MCD in consultation with the NDMC, DDA, Delhi Traffic Police and Government of the National Capital Territory of Delhi had formulated a parking policy. The parking policy envisages the construction of multi-storey under ground parking, different parking charges for different parking areas, implementation of metro rail project, introduction of high capacity bus service, electric trolley bus system, pedestrianisation of markets and optimum use of land for parking places. He said that to fill up vacant posts in the Corporation, the MCD had sent requisitions to the Delhi Subordinate Staff Selection Board. A leading social activist in the area has served a legal notice to the District authorities and the Municipal Corporation Faridabad (MCF) to take action against the ‘encroachments’ or face a legal action. Mr K.L. Gera, resident of Sector-15-A here, who has already filed a couple of PILs in the Punjab and Haryana High Court over the issue of alleged encroachments in the town, has now notified the local administration about the illegal construction in Surajkund. The place has great potential to develop as prime residential area, in view of the new sectors and multi-storeyed buildings coming up at a fast rate. Alleging that certain colonisers and private builders, in collusion with the ‘officials’ of the MCF, had been carrying out illegal construction on the land meant for the forest only, he claimed that this activity was not only illegal but also in gross violation of the Supreme Court order. The court order had prohibited the use of ‘khasra’ numbers 659 and 920 for any non-forest activity, without the permission of the Central Government. He has alleged that till date, large-scale unauthorised construction in the above-mentioned khasras, located near the Anangpur village, had been going on, without the permission of the Union Government. holding the charge of the post of the Commissioner, MCF, to initiate an action against the encroachers and punish the officials, who, he alleged, had been allowing such an activity. He demanded that the state government should order a high-level probe into the matter and expose the racket. He has threatened to file a petition in the High Court, if no action is taken within 15 days. Mr Gera has also sought action against the ‘encroachments’ on the service road, on the Highway, near the main bus stand at Ballabhgarh town. In a joint raid conducted by the Delhi Police and the FICCI’s Brand Protection Committee (BPC) in Najafgarh area of Delhi, machinery and packaging material worth Rs 5 crore has been seized. The raid was conducted after complaints that duplicate domestic goods were being sold in the market under the brand name Proctor and Gamble. During the raid in Najafgarh, the police arrested Akhil Ahmed, partner at Amin Printers. The latter is regarded as one of Capital’s counterfeit kingpins. Cheap imitation products are giving sleepless nights to the consumer goods manufacturers and costing the domestic FMCG industry Rs 2,500 crore annually. The loss to the government in sales tax accruals from such spurious products is 10 per cent, excise duty 15 per cent, octroi two per cent and income tax 45 per cent, taking the financial toll to Rs 900 crore every year. These staggering facts came into light during the BPC meeting organised by FICCI here today, where leading FMCG players, Hindustan Lever and Proctor and Gamble, contended that there is a need to address counterfeiting as an industry issue rather than as a company issue. The Rs 800-crore Procter and Gamble is losing 2-5 per cent annually owing to fake products of its popular brands, its Executive Director Ashok Chhabra said. Similarly, Hindustan Lever is also losing cash out of the prevalence of counterfeits in the market. 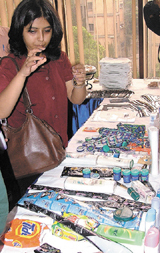 To counter the menace of counterfeit products in the FMCG industry, FICCI Secretary General Amit Mitra said, the BPC has adopted a four-fold strategy to address this issue which includes measuring and publicising negative economic impact, open communication channels between the stakeholder to generate awareness and stimulate action, take action against the offenders and advocate more effective enforcement of existing laws and regulations. In view of the sensitive nature of incident, DM Om Shek Singh and SSP Rajinder Pratap Singh of Bulandshahr rushed to the spot with a police force. A platoon of PAC was deployed in the village and the officers of the Bulandshahr district administration stayed put in the village for the whole day. A fair on the banks of Ganga is a regular feature on each Amavas (moonless night) and Poornmasi (full moon night) in Ram Ghat town and quarrels among the shopkeepers over the installation of their stalls is quite common. On Monday, two shopkeepers belonging to different communities, started quibbling over a spot. When the heated exchange peaked, one shopkeeper killed another. The lynching of the killer by people of other community caused further tension. Sanjay, son of Ram Array, and Suleman, son of Munshi Khan, had clashed on Monday on the issue of putting their shops on the same spot. As a result, Sanjay was killed on the spot and Suleman fled from the scene. Seeing Sanjay’s body, people went ballistic and searched Suleman out in Hallalpur’s jungles. They beat him up so severely that he died on the spot. DM Om Shek Singh and SSP Rajinder Pratap Singh rushed to the fair ground after they got the news. A platoon of PAC was deployed in the village in view of the tension. The Loni police in Ghaziabad arrested five notorious bootleggers of Bulandshahr and seized heroin worth Rs 50 lakh, which was being smuggled into Delhi via Bulandshahr. The accused were nabbed by the Loni police near the culvert of Roni village while they were going in a car and on a motorbike. A hundred gram heroin was seized from each of them, SSP Jai Narayan Singh said. The criminals were identified as Govind of Hallalpur, Rajinder of Saidpur Bobby Nagar, Hasmat of Partappur village, Vinod of Saidpur and Chhatarpal of village Anup Shahar. According to SSP Ghaziabad, the narcotics recovered from them are worth Rs 50 lakh on the international market. One of their companions of Bulandshahr had brought it from Mathura and they were told to hand over the illegal consignment to someone in Delhi. In another case, the Kotwali police nabbed three chain snatchers and recovered three chains, a motorcycle and local pistols and knives from them. They were nabbed during a checking near Jassi Pura crossing. Later, they were identified as Sirajuddin, alias Shaukin, Yaseem, both from Islam Nagar Mohalla, and Tony, alias Raju, of Nand Gram Mohalla. According to reports, a truck driver identified as Gopal was killed last night, after he came into contact with a high-voltage power line. He was sleeping on the roof of the truck parked in the vicinity of a petrol pump. In another incident, an employee of factory in the DLF industrial area identified as Jitender got electrocuted as a fan which he was repairing, fell on him. He succumbed to his injuries in the local civil hospital yesterday. In yet another similar incident, one Shyam Arora, owner of an STD PCO in the NH- 5 Market here died from burns, which he suffered due to a fire that broke out in his shop at noon yesterday. Coming down heavily on CBI, the court said despite the case being a serious and non-bailable one, the agency granted bail to R. Venkatesh, and that too without recording reasons for the same. The incident happened in Sihani Gate police area on Monday. 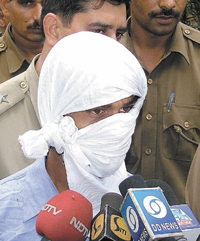 Subash lured Hari Singh’s four-year-old daughter to his room and raped her. By the time the child’s mother came to know of the incident and reached the place, the accused had fled from the house. He was caught by the neighbours after sometime and given a sound thrashing. He was handed over to the police.